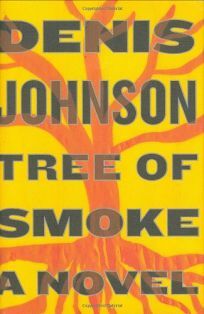 If this novel, Johnson's first in nearly a decade, is—as the promo copy says—about Skip Sands, it's also about his uncle, a legendary CIA operative; Kathy Jones, a widowed, saintly Canadian nurse; Trung, a North Vietnamese spy; and the Houston brothers, Bill and James, misguided GIs who haunt the story's periphery. And it's also about Sgt. Jimmy Storm, whose existence seems to be one long vision quest. As with all of Johnson's work—the stories in Jesus' Son , novels like Resuscitation of a Dead Man and Fiskadoro —the real point is the possibility of grace in a world of total mystery and inexplicable suffering. In Johnson's honest world, no one story dominates. For all the story lines, the structure couldn't be simpler: each year, from 1963 (the book opens in the Philippines: “Last night at 3:00 a.m. President Kennedy had been killed”) to 1970, gets its own part, followed by a coda set in 1983. Readers familiar with the Vietnam War will recognize its arc—the Tet offensive (65 harrowing pages here); the deaths of Martin Luther King and RFK; the fall of Saigon, swift and seemingly foreordained. Is this our last Vietnam novel? One has to wonder. What serious writer, after tuning in to Johnson's terrifying, dissonant opera, can return with a fresh ear? The work of many past chroniclers— Graham Greene, Tim O'Brien, the filmmakers Coppola,Cimino and Kubrick, all of whom have contributed to our cultural “understanding” of the war—is both evoked and consumed in the fiery heat of Johnson's story. In the novel's coda, Storm, a war cliché now way gone and deep in the Malaysian jungle near Thailand, attends preparations for a village's sacrificial bonfire (consisting of personal items smashed and axed by their owners) and offers himself as “compensation, baby.” When the book ends, in a heartbreaking soliloquy from Kathy (fittingly, a Canadian) on the occasion of a war orphan benefit in a Minneapolis Radisson, you feel that America's Vietnam experience has been brought to a closure that's as good as we'll ever get. Michael Coffey is PW's executive managing editor.